The new men's basketball coach Jamion Christian spoke Monday afternoon at a press conference held in the Smith Center. Head coach Jamion Christian proved he is no stranger to rebuilding men’s basketball programs during his remarks at an introductory press conference Monday afternoon. Christian was named head coach of men’s basketball last week and takes the helm of a program coming off its lowest winning season in more than a decade. As he begins leading the Colonials, Christian said he is looking to establish a culture of trust, love and accountability that will lead to more success for the team on the court in the future. Christian was hired less than one week after former men’s basketball head coach Maurice Joseph was let go from the position. University President Thomas LeBlanc said Christian stood out during the interview process because of his energy and optimism as a leader. 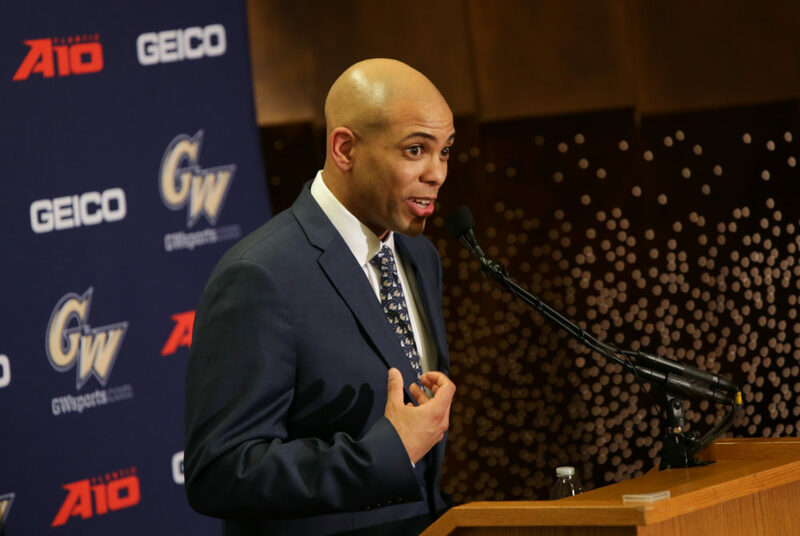 “Jamion embodies discipline and excellence, which I believe are critical to any college athletics program and I am confident that he will lead the men’s basketball at GW with these values,” he said. In his only season at Siena, the Saints were coming off an 8–24 showing in the 2017-18 season – the lowest win-total for the program in 13 years. Under his tutelage, the Saints were able to improve to a 17-win record and a second-place finish in the Metro Atlantic Athletic Conference the next season. Before he was a Saint, Christian spent six seasons at Mount St. Mary’s, where he reversed the team’s 8–21 record in the 2011-12 season and turned in 10 more wins in the following season to end with an 18–14 record. Christian boasts two NCAA Championship appearances in his head coaching tenure at Mount St. Mary’s. “Jamion is going to put his stamp on the program quickly while understanding and respecting our storied history and leading us back to the top,” athletic director Tanya Vogel said. Christian, who mentioned in opening remarks he will be in the coaching position at GW for five years, is set to inherit 12 members of the Colonials’ squad – missing only freshman guard Shandon Brown who announced his plans to transfer out of the program last week. He said as a coach, he is going to demand the best of his players every day to start changing the mindset within the program. Christian brings a “mayhem” style of play that focuses on high-intensity defense and a three-point shooting offense. The Colonials struggled defending the perimeter this season, allowing opponents to shoot 35.6 percent from the three-point line while giving up 71.4 points per contest on average. In his single season at Siena, Christian improved his team’s defensive numbers, decreasing the number of points scored by opponents per game from 75.0 to 66.0 points per contest. “We’re still evaluating the roster right now to see if we’re able to do that, but what we’re going to do best is we’re going to take a great coaching staff, we’re going to get together and we’re going to work with our players in a good collaborative way,” Christian said. In his first year as head coach, Christian said he will measure success by the level of effort he gets out of his team and his coaching staff – which has not yet been announced.